India has begun the process to acquire a fleet of around 110 fighter jets word USD 15 billion. US defence major Lockheed Martin has welcomed India's mega procurement initiative. American aerospace and defence major Lockheed Martin has welcomed India's mega procurement initiative for fighter jets worth over USD 15 billion and said that it looks forward to responding to the initial tender. India yesterday began the process to acquire a fleet of around 110 fighter jets in one of the biggest such procurements in recent years globally which could be worth over USD 15 billion. At least 85 per cent of the aircraft will have to be made in India while 15 per cent of them can be in a flyaway condition. An RFI (Request for Information) or initial tender for the mega-deal was issued by the Indian Air Force and the procurement will be in sync with the government's 'Make in India' initiative in the defence sector, officials said. "Lockheed Martin welcomes India's fighter aircraft Request for Information (RFI) and we look forward to responding to it," said Dr Vivek Lall, vice president, strategy and business development at Lockheed Martin. "The F-16 remains the only aircraft programme in this competition with the proven performance and industrial scale to meet India's operational needs and 'Make in India' priorities including unmatched export opportunities," he said. Indian-American Lall was last year instrumental in the decision of the Trump administration to sell top-of-the-line unarmed drones from General Atomics. Lockheed Martin has positioned the newest Block 70 variant of its F-16 aircraft for the Indian Air Force, while Boeing has offered its F/A-18 Super Hornet Block III for the Indian Navy. "The two aircraft have been positioned complementarily, and the purchase of the pair is an interesting proposition for policymakers from both countries," US-based think-tank Atlantic Council said in a report released in New Delhi yesterday. In the report, 'India's Quest for Fighter Jets: Make in India vs Make America Great Again', it said China's bellicose incursions in the Indo-Pacific region are challenging US geostrategic supremacy in the region. Consequently, improving India's capacity to play a stronger role in the region would play a critical role in the US grand strategy, the think-tank said. The F-16s and the F/A-18 Super Hornets manufactured in India would not be sold to the US, it said. The F-16 production line will be used to service the orders from the Indian Air Force, as well as any follow-on international orders. Noting that the US Air Force has not bought an F-16 since 1999, and is transitioning its multi-role fighter force to the F-35, the think-tank said that any additional F-16 orders would be for non-US customers. An India partnership presents a way to sustain F-16 production, with all the economic and strategic benefits that result, it said. Similarly, the F/A-18 Super Hornet production line would also be used to service orders for the Indian Navy, with all US orders manufactured in the US. India's latest hunt for over 100 fighter jets is the first mega procurement initiative for fighter jets after the government scrapped the process to acquire 126 Medium Multi-Role Combat Aircraft (MMRCA) for the IAF around five years ago. 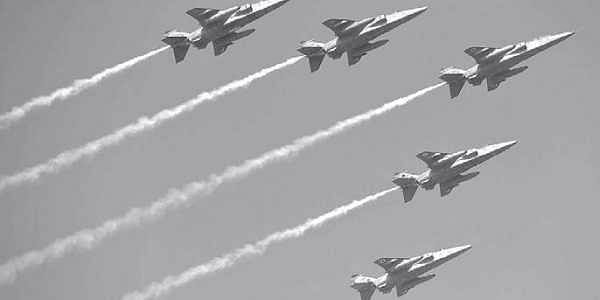 The IAF has been pressing for expediting the process to acquire the aircraft citing declining strength of its fighter squadron as some of the ageing jets are being phased out.